Those who planned our new church wisely made use of symbols. The Gothic style of architecture in itself is symbolic. The arches pointing upwards –seen in the Nave window, the chancel arch, and even in the ceiling itself – are a reminder of the things above. From the lectern you hear the Word of God being read; you hear laymen reading and speaking. On the other side is the pulpit, and from it those whom God has ordained, preach the Word. Beginning on the north side at the rear of the Nave, the first group honors three of the subsidiary organizations of our church. The first is the Methodist Youth Fellowship window, using the MYF emblem and motto – Christ Above All. The middle window honors the Sunday School and symbolizes Christian growth through learning by using the lamp of Christian Knowledge (note that gold in the windows symbolized Christ) and Christ’s words: “Learn of me.” The third window honors the Women's Society of Christian Service (now United Methodist Women). Reproduced in stained glass is their beautiful and meaningful emblem. The middle group of three symbolized the Christian and his World. The first window, the Christian Citizenship window, portrays the Christian and his country by use of the gold cross before an American flag. 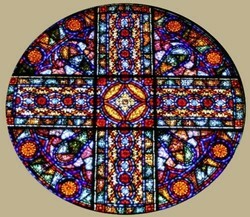 The middle window, the Christian Stewardship window, designed at the request of the Building committee, symbolized the Christian and his Possessions. The ten ears of golden corn represent God’s gifts to man. The one ear dropping into the basket before the spire represents the tithe; while the extra kernels represent the offerings: “Bring ye tithes and offerings.” Below is a quotation from Malachi 3:8: “In tithes and offerings.” The third, the Christian Brotherhood window, symbolized the Christian and his Fellowmen. The two hands, representing two races, are joined before the cross, the symbol of sacrificial love of Christ. The trinity of windows closest to the altar on each side, refers directly to the Christ. The group on the north side is the CHRIST windows. The first one presents Christ as the vine. 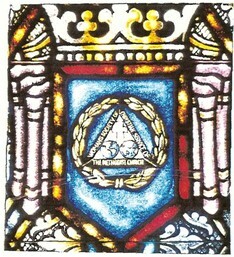 This symbol, a reproduction in stained glass of the vine-cross in the Little Chapel at Simpson College, shows the vine on the lower vertical arm. The two horizontal arms contain the A and Ω symbols, while the upper vertical arm has the dove, symbol of the Holy Spirit. Below are the words of Christ: “ABIDE IN ME.” The middle window presents Christ as the Way. In the foreground are seen the ruins of a war-shattered and sin-torn world. Behind the radiant cross is seen the horizon of a new and better world. Christ is the Way. The third of this group symbolized Christ, the Anchor of Our Hope The gold anchor (note the cross in the design of the anchor) represents Christ as the Anchor of Our Hope and of Our Faith. The trilogy of windows at the rear on the south side presents Necessary Aids to the Christian Life. The first window shows the open Bible. The tablets of the Ten Commandments representing the Law, and thus the Old Testament, are on the left-hand page. The Radiant Cross of the triumphant Christ on the right-hand page represents the New Testament. These emphasize the need to "Search the Scriptures." The middle window emphasizes the central part of any Christina’s life, prayer. Durer’s famous work “The Praying Hands,” beautifully and worshipfully reproduced in stained glass, reminds us of the necessity of prayerful service in the Christian’s life. The third window emphasizes the social nature of the Christian gospel, and reminds us of the necessity of regular Public Worship. Our own entrance with its beautiful Bedford stone cross proclaims that worship is important for spiritual vitality. The rose window is lit by the morning sun as it sits on the south end of the alter. Its circular shape reminds one of the Eternal – no beginning or end. The dossal curtain contains a number of symbols. The IH∑ symbol, which is also seen on the altar, on the cross, and even in the window, are the Greek letters for the name Jesus. Also in the dossal curtain are to be seen the Rose of Sharon, the vine, the grapes (the Cup in communion), the Lamb (Pascal Lamb of sacrifice), and the Trifoliate (Trinity). On the face of the altar, in addition to the symbol IHS for the Son of God, who came that men might see and know the nature of God – we have the symbols A and Ω, the first and last letters of the Greek alphabet. These symbolize Christ as the beginning and the end of our Faith (Rev. 1:8).